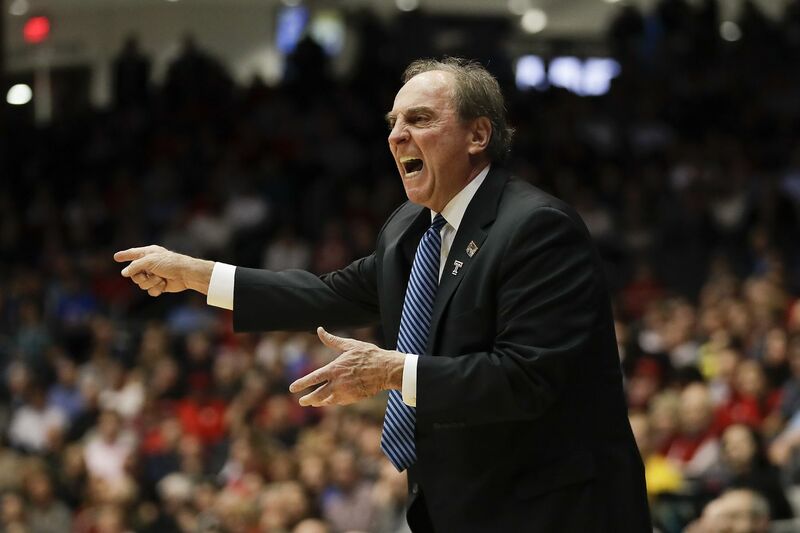 Fran Dunphy will be inducted into the Big 5 Hall of Fame in April. Fran Dunphy, just retired as Temple’s coach, heads a class of Big 5 Hall of Fame inductees to be introduced at the Palestra on April 15. Dunphy, a La Salle graduate who coached three decades at Penn and Temple, will be joined by another La Salle grad, Bill Bradshaw, who served as athletic director at La Salle and later at Temple and more recently again at La Salle, now finishing his last academic year before retirement. The inductees, who were announced Tuesday, also include former St. Joseph’s women’s basketball coach Jim Foster, who led four programs to the NCAA Tournament; former Temple women’s star Kamesha Hairston; former La Salle star Steve Smith; former Villanova star Mike Nardi; and former Penn star Mark Zoller. The Hall of Fame, chosen by the schools, was basically waiting for Dunphy’s retirement to induct him. He is the all-time winningest Big 5 coach, with 580 wins over 30 seasons, and the only coach to be in charge of two Big 5 basketball programs, leading Penn and Temple to a combined 17 NCAA Tournament appearances. In addition to leading St. Joe’s to seven postseason appearances (one AIAW in pre-NCAA era, six NCAA), Foster also coached Vanderbilt, Ohio State and Chattanooga to the NCAA Tournament. Foster was instrumental in getting the Big 5 women’s city series off the ground. He retired last May with 903 career wins, placing him seventh on the all-time women’s basketball coaching list. A former La Salle baseball player, Bradshaw is the only athletic director to run two Big 5 athletic departments, working as DePaul’s AD between his stints at his alma mater and Temple, where he hired Dunphy as head coach. Hairston was Big 5 player of the year as a senior in 2007, two-time all-Big 5 first team and part of three Big 5 championship teams. She scored 1,573 career points, and led the Atlantic 10 in scoring as a senior. Nardi, now a Villanova assistant coach, was a four-year starter for the Wildcats during a big era of success, reaching the NCAA Sweet 16 in 2005 and the Elite Eight in 2006. He scored 1,306 career points. Smith was a two-time all-Big 5 selection at La Salle and twice Atlantic 10 player of the year — the only Big 5 player to achieve that honor twice, sharing it with Pat Carroll of St. Joe’s in 2005 and winning it solo in 2006. Smith finished with 1,940 career points, seventh in school history. Steve Smith, Big 5 Hall of Fame inductee, talking with the late John Hardnett during a summer workout while Smith continued his career professionally in Italy. A four-year Quakers starter, Zoller was part of three Ivy League title teams, and still is among the all-time leaders in points (1,429; 12th), rebounds (750, ninth), and steals (141, sixth). He twice was named first-team all-Ivy and was first-team all-Big 5 as a senior in 2007. Tickets can be purchased in advance for $15 at the Penn athletics website or for $20 at the door. The banquet will begin at 6 p.m.